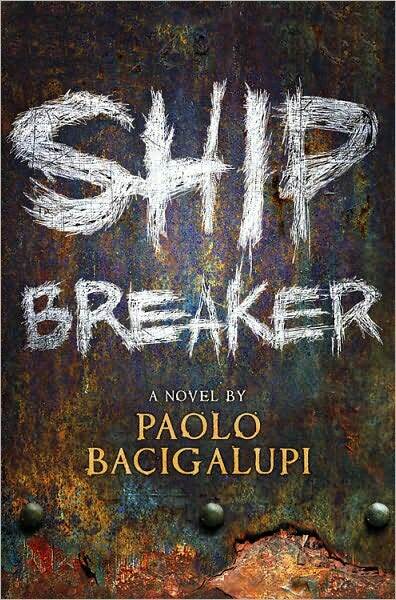 I enjoyed Ship Breaker much more than Marcus of Umbria. It has been a very long time since I've blown through a fiction book so quickly. Young adult novels may be below my 'reading level' but I can still enjoy a good one (and when would I ever read the bad ones? ;P). YA novels are usually much better written than so-called 'adult fiction' - once I find a good YA novel, it leaves more of an imprint on me than anything else does. I can enjoy it immensely and learn from it for my own writing. Now that I've said all that about YA, I need to backtrack a bit...Ship Breaker was a good book but not one of the ones that has made a lasting impact on me. It was an enjoyable read, brought up some good ideas, had a few tense moments, but the characters didn't make an emotional impact on me. That's okay. Not every novel has to be made of John Green moments. One of the things I liked best about this book was that it presented certain ideas well that I feel are usually presented awkwardly (like this sentence :P). One of the issues the book tackles is the morals of protecting the environment over making money (the novel is set in 'Orleans' where everything has been destroyed by impossibly strong hurricanes) and it actually presents both sides well, as in: you can see why somebody might take the money over the environment, which I usually have a hard time understanding. Another issue the book handles nicely is that of the morals of killing. Usually I find that after a character's 'first kill' they're overcome with guilt to an extreme that's a little unbelievable. That didn't happen as much in this book; it felt more natural. A few more thoughts...The book is an action/adventure and that is exactly what it feels like. It's not tickly - emotional at all. I didn't form any attachments to the characters, but they felt fairly well-developed and unique. No hero stereotypes here.The ending was a little abrupt, I like a fuller ending but it does wrap up the story. All in all, Ship Breakers was a fun and thoughtful read. I'd probably recommend it if you're looking for something fast paced and gritty but enjoyable.